In a chart you create, axis labels are shown below the horizontal (category, or "X") axis, next to the vertical (value, or "Y") axis, and next to the depth axis (in a 3-D chart). Your chart uses text from its source data for these axis labels. 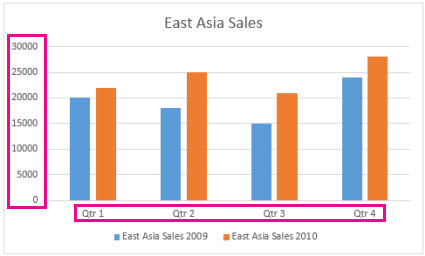 Don't confuse the horizontal axis labels—Qtr 1, Qtr 2, Qtr 3, and Qtr 4, as shown below, with the legend labels below them—East Asia Sales 2009 and East Asia Sales 2010. Click each cell in the worksheet that contains the label text you want to change. Type the text you want in each cell, and press Enter. 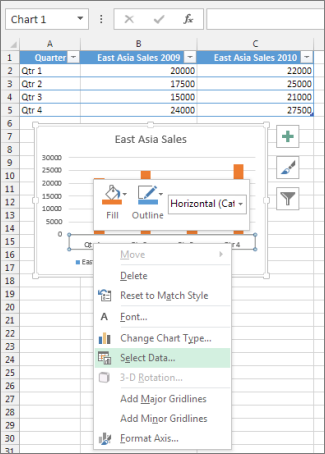 As you change the text in the cells, the labels in the chart are updated. Right-click the category labels you want to change, and click Select Data. In the Horizontal (Category) Axis Labels box, click Edit. In the Axis label range box, enter the labels you want to use, separated by commas. For example, type Quarter 1,Quarter 2,Quarter 3,Quarter 4. Right-click the category axis labels you want to format, and click Font. On the Font tab, choose the formatting options you want. On the Character Spacing tab, choose the spacing options you want. 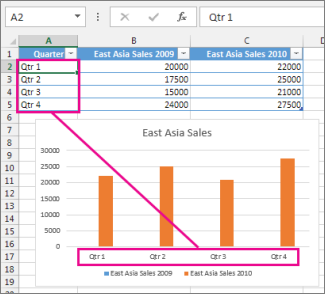 Right-click the value axis labels you want to format. In the Format Axis pane, click Number. Tip: If you don't see the Number section in the pane, make sure you've selected a value axis (it's usually the vertical axis on the left). Choose the number format options you want. 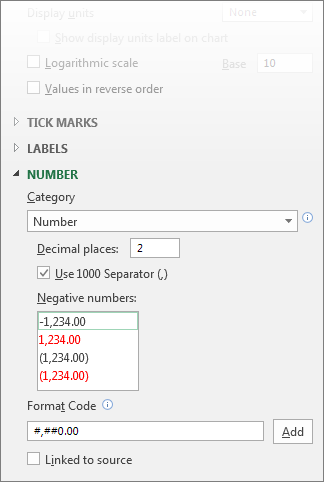 If the number format you choose uses decimal places, you can specify them in the Decimal places box. To keep numbers linked to the worksheet cells, check the Linked to source box. Note: Before you format numbers as percentages, make sure that the numbers shown on the chart have been calculated as percentages in the worksheet, or are shown in decimal format like 0.1. To calculate percentages on the worksheet, divide the amount by the total. For example, if you enter =10/100 and format the result 0.1 as a percentage, the number is correctly shown as 10%. Tip: An axis label is different from an axis title, which you can add to describe what's shown on the axis. Axis titles are not automatically shown in a chart. To add them, see Add or remove titles in a chart.